Before Malala Yousafzai walked out to a standing ovation on Monday night, the sold-out crowd was already abuzz with excitement. Members of the AU community stood in long lines outside Bender Arena waiting to catch a glimpse of the 2017 Wonk of the Year. Inside, students tried to answer Wonk quiz questions about her. 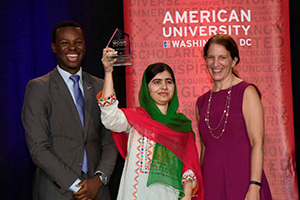 Yousafzai is the youngest recipient of what award? The Nobel Peace Prize. And while watching video footage of previous AU speakers, the crowd erupted with applause when the faces of former president Barack Obama and Canada’s Prime Minister Justin Trudeau flashed on the big screen. The WOTY event was hosted by the AUSG Kennedy Political Union, the university, the AUSG Women’s Initiative, and the Muslim Student Association. Earlier WOTY honorees were Bill Clinton, Anderson Cooper, Laura Bush, and Donna Brazile. AU celebrates each WOTY for embodying four qualities: intelligence, passion, focus, and engagement. After Yousafzai’s speech, she sat down with President Burwell for a question-and-answer session. Here are nine memorable moments from the evening. 1. Yousafzai referenced previous Wonk winners, and how she is different. "I am the first foreigner to receive this. I am the first Pakistani to receive this. The first Muslim to receive this...I'm also the first Pashtun to receive it. I'm also the youngest one to receive it. And I'm also the shortest one to receive it," she joked. 2. On speaking out for girls’ education in her home region in Northern Pakistan: “I realized that when my education is banned, I would not be able to follow my dreams—to become a doctor, to become a teacher, to be myself,” she said.